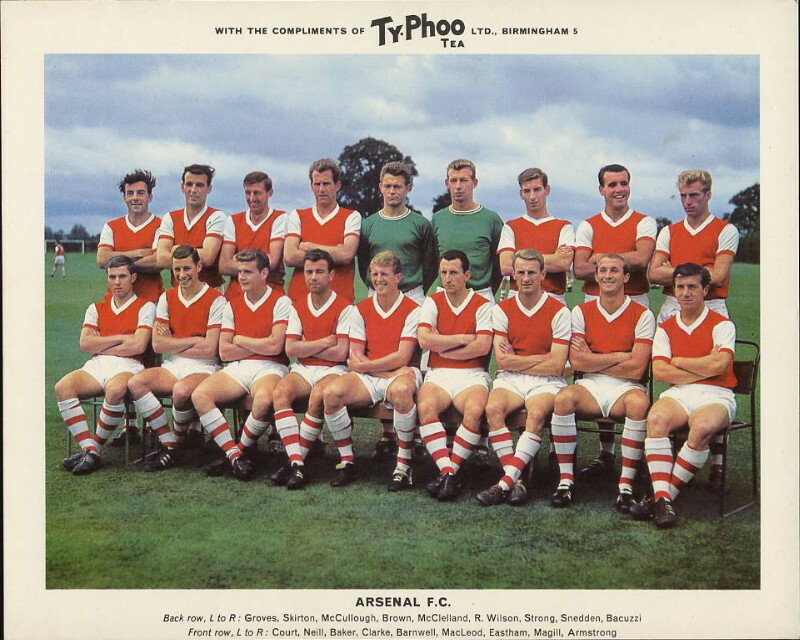 Ty-phoo, now part of the Premier Foods Group, produced a series of football cards on their tea packets between 1963 and 1973. The name Typhoo, apparently the Chinese word for Doctor, was used as a brand name for tea from 1905 onwards. The company produced cards on the side of their tea packets from the 1920s onwards for a variety of subjects, including dogs, ships, flowers etc. In 1968 Typhoo merged with Schweppes, then again with Cadbury in 1969. Series 1 was produced in 1963 as a set of 24. 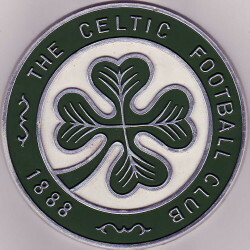 Series 2, which included many of the same teams as the first series, was produced in 1965. The cards were able to be cut from the side of the tea packets. The quality of the cards therefore depends a lot on the person who cut them out, since this dictates how much of the packet was included, and how neat the borders will be. 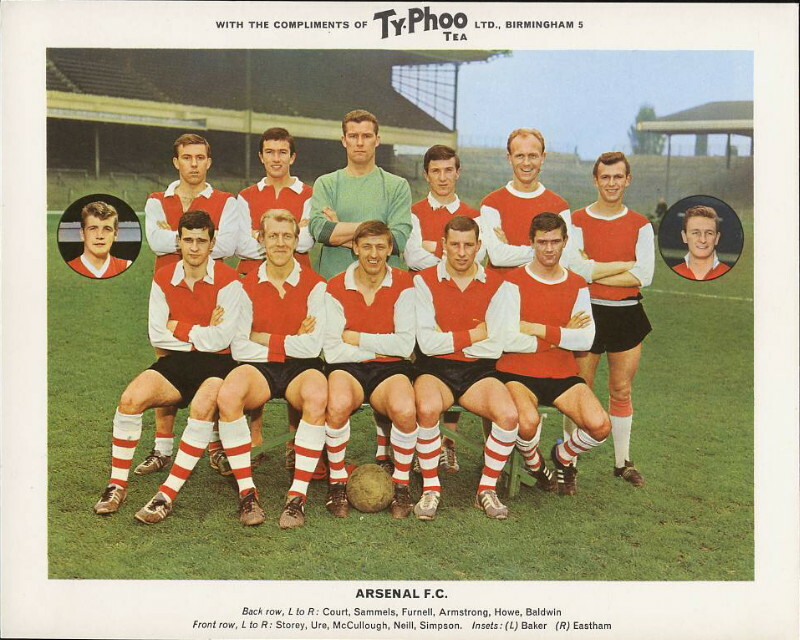 If you collected any 12 of the tea packet cards you could send them away to Ty-Phoo Tea and obtain a 10" x 8" colour photo of your favourite team, 'suitable for framing'. Interestingly the team photos on the Premium cards are not the same as on the packet cards. The set gallery for this set includes team players and additional information on the club's recent history. A second series of the packet clubs, with the offer of the premium issues As with Series 1 the club photos on the packets are different from the 10 x 8's, though the Stoke City photos are eerily similar (it looks like the same team photo taken on the same day from a different angle). The cards were able to be cut from the side of the tea packets. The quality of the cards therefore depends a lot on the person who cut them out, since this dictates how much of the packet was included, and how neat the borders will be. Some people cut them out with the accompanying text, while others cut around the picture only. If you collected any 12 of the tea packet cards you could send them away to Typhoo Tea and obtain a 10" x 8" colour photo of your favourite player, 'suitable for framing'. 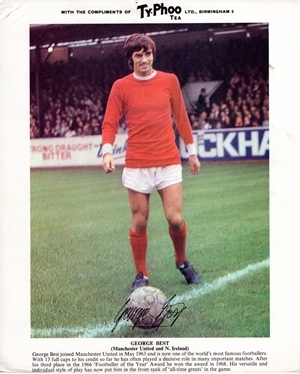 One interesting aspect of the Colour Pictures set is the existence of two versions of the Derek Dougan card, one for Leicester City and the other for Wolverhampton Wanderers. 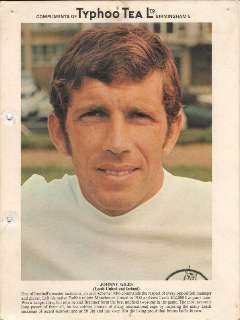 Dougan was transferred from Leicester to Wolves in March 1967. The text on the Leicester card reads exactly the same as the Wolves version of the card, except that they have added in the transfer details i.e. ‘Aston Villa and Peterborough’ has become ‘Aston Villa, Peterborough and Leicester City’. This indicates that the set was produced in February/March/April 1967. The Leicester City version of this card, including a photo of Dougan in Leicester kit, is very rare and hence very collectable. This website does not know whether the Leicester City version of the Dougan card was ever sent to the public. We can perhaps assume one of two things (1) the Leicester card was produced and sent out amongst the earliest to those who requested it, and then replaced by the Wolves card or (2) the Leicester card was never issued as the Wolves card was always sent out. The Gordon Banks card in this set has an asterisk against the team name and a note at the end of the text which says ‘Since transferred in April 1967 to Stoke City’, which confirms that the cards were designed in early 1967. Bank's transfer was not reflected on the packet issues of this card. There are two known variants in this set, described in the Set Gallery. Interestingly these plaques were also offered from the Co-Op, also for 25p each. There were some differences between the plaques offered by Ty.phoo and the Co-op, plus there are additional plaques known to exist which were not offered through either Ty.phoo or the Co-op. Note that the advertisement says 'Choice of 35', but I am aware of 40 possibilities (as per the checklist). The cards were able to be cut from the side of the tea packets. The quality of the cards therefore depends a lot on the person who cut them out, since this dictates how much of the packet was included, and how neat the borders will be. Some people cut them out with the accompanying text, while others cut around the picture only.You needed to collect 12 of the white footballs from the packets and post them to Typhoo stating which of the set of 24 you required. If you collected any 12 of the tea packet footballs you could send them away to Typhoo Tea and obtain a 10" x 8" colour photo of your favourite player.